Recipe development, photography/videography, and dinner parties are the bread and butter of my work here at Brewing Happiness. I am always thrilled to find like-minded brands and human beings collaborate with on such projects. I have a range of unique content packages that can be customized to your needs or preferences. Let’s talk! Recipe development – Developing recipes with a health-ier twist is my specialty, as well as one of the things closest to my heart. If you have a product that fits into this health-ier world, or if you’re trying to health-ifiy your image I’m the girl to do it. Videography & Editing – Before Brewing Happiness began, I was an actor with a film degree. So making video content for brands and other bloggers is my favorite way to put all of that knowledge and experience into practice. So no matter if you want a spokeswoman for your brand, or a *beautiful* custom brand-focused video I’d be thrilled to collaborate. Photography – The core of what I do is food photography and styling, but on the side I’ve been known to shoot weddings, portraits, and events. In the past I’ve worked with local restaurants and brands, both large and small, to develop photos for a new menu, site, and look. 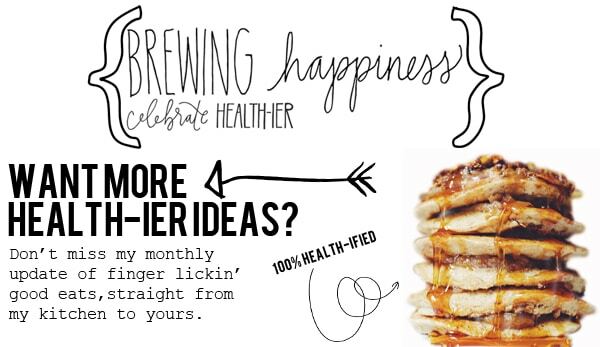 Through Brewing Happiness we can collaborate on anything from brand-integrated photography for a recipe to a full marketing overhaul session. Events / Dinner Parties – Being a southern girl at heart, playing hostess is one of my favorite things to do. In the past I’ve hosted events with Amy’s Kitchen, Paper and Stitch, and The Dinner Party Association. I find these types of events allow for a rich, deep connection to a brand and create beautiful content. Plus, you don’t have to worry about a thing! I do all of the recipe planning and execution, decorating, and photography/videography. Let’s party! Brand Ambassador – Becoming a face for a brand that integrates well with my health-ier messaging is such a joy. This means I can represent you in a number of ways from recipe development, social media takeovers, brand-integrated videos, appearances, or even speaking at conferences. Maybe you have something even more new and exciting in mind – I want to hear about it!